Vroom vroom, Berkely Bear zooms up to the drive-thru. 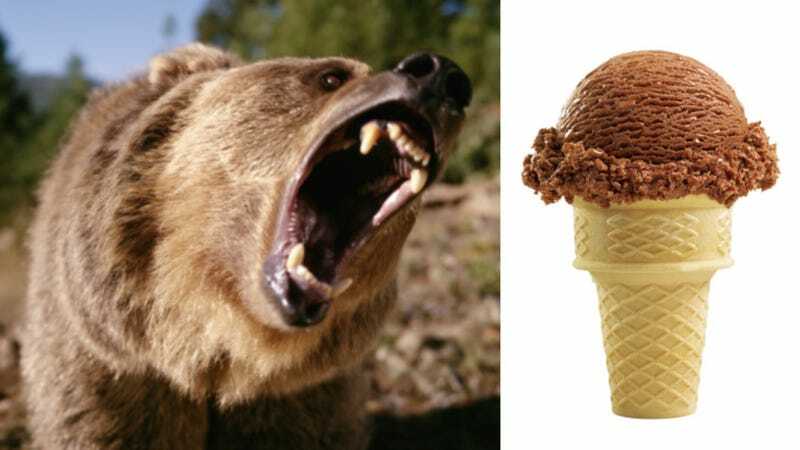 Look, Berkely Bear wants an ice cream! Lick lick lick goes Berkely Bear’s tongue. Beep beep beep goes the car horn. Mmm mmm mmm goes Berkely Bear’s tummy. Berkely Bear loves ice cream! Nope, didn’t plagiarize that from a Richard Scarry book; I’m just transcribing the scene that played out at a Dairy Queen drive-thru in the Canadian province of Alberta earlier this month. According to the CBC, Berkely is a Kodiak bear and is normally a resident of Discovery Wildlife Park in Innisfail, Alberta. But a Jan. 14 video posted to Twitter and Facebook (later deleted) showed Berkely—also spelled as Berkley, depending on the source you consult—enjoying a vanilla ice cream hand-fed by the Dairy Queen employee. In a shocking twist, this is not standard zoo management practice. Various conservation and wildlife groups have alerted provincial officials to the incident, which they say poses a threat to the public and is the latest in a series of complaints against Discovery Wildlife Park. “It’s a challenge every day out there in our parks and protected areas to try to teach people who are visiting these places or live here in Alberta that we don’t feed wildlife, that we don’t feed bears,” Kim Titchener of Bear Safety & More tells the CBC. For their part, Discovery Wildlife Park staff told reporters Berkely is “a captive bear, so not a wild bear in any way,” and is definitely not a 1,200-pound animal capable of shredding a human face.